The Author spent a happy childhood in the small, Saxon, German town of Bischofswerda. Following completion of school there, he was trained in commercial practices and served a business apprenticeship in nearby Dresden. As an independent merchant and business owner, and later as part owner of a larger import/export firm, Oskar Ernst Bernhardt traveled extensively. 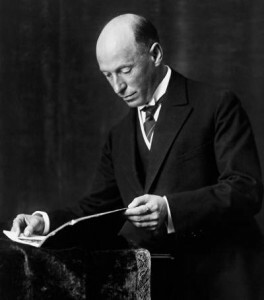 His experiences and impressions soon prompted him to set aside the mercantile profession in favour of his literary inclinations, and as of 1907 he worked solely as a writer, producing travelogues, short stories and novels. As a playwright, he gained notable success. A year long stay in New York, from 1912 to 1913, was followed by a journey to London where the Author intended to further his education, but—as a German national (now forty years old), at the outbreak of World War I—was arrested and interned on the British Isle of Man. Through four years of imprisonment, from 1915 to 1919, the Author experienced the inner distress of a humanity which could no longer find a way out of the chaos of the old collapsing system of values. A recognition and knowledge of vital, overarching connections, and the wish to help suffering human beings awakened within him. In 1928 Abd-ru-shin settled in the Vomperberg Mountains in Tyrol near Innsbruck, Austria, and there he completed his Grail Message. Ten years following, in 1938, Austria came under German occupation; the National Socialists seized his property and the book “In the Light of Truth” was banned. The distribution of his books and further dissemination of his Work was forbidden, and the Author was arrested. After six months of imprisonment in Innsbruck, under oppressive conditions, he was forced to leave occupied Austria. Eventually, Abd-ru-shin found refuge in Kipsdorf, in the Ore Mountains of Saxony. During this time of house arrest, his requests to be active in public and to receive visitors were denied. He was under constant supervision and surveillance by the Nazi Gestapo. The Author used the years of exile for the revision of his Grail Message, and determined that only this final edition be designated for distribution. But isolation and repression had its consequences: on December 6, 1941, in Kipsdorf, at the age of sixty-six, Abd-ru-shin suffered premature death.